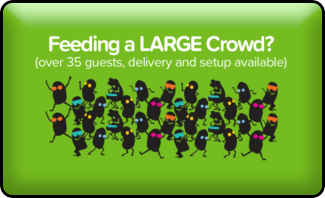 For Events, Businesses and Parties, CLICK on the button below that describes your catering need. We love our Customers and enjoy their visits to Calypso… and we also delight in being a part of their celebrations and events! Over the years, countless first dates at Calypso evolved into rehearsal dinners, weddings and baptisms that we were honored to cater! We’ve done graduation parties for our student customers, video shoots for our artists, and team dinners for our athletes. YES, we do them all! Calypso is fun, easy and, of course, healthy to fuel the most competitive athletes as well as the most focused business executives. We specialize in affordable, casual events, celebrations, and meetings. 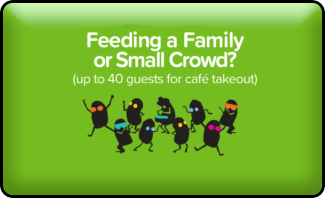 We can feed a HUGE crowd or a small group. Feeding guests who are Vegetarian, Vegan, or Gluten Sensitive, OR guests with allergies? NO PROBLEM! We’ve Got You Covered! See our Cafe Menu icons as well as our Nutrition Page for more information on our offerings.